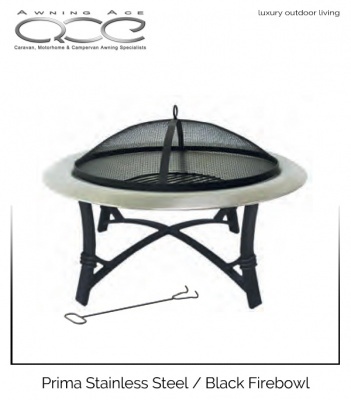 Add warmth and ambiance to your outdoor entertaining with this sleek and elegant firepit adding style and panache to your garden or patio. 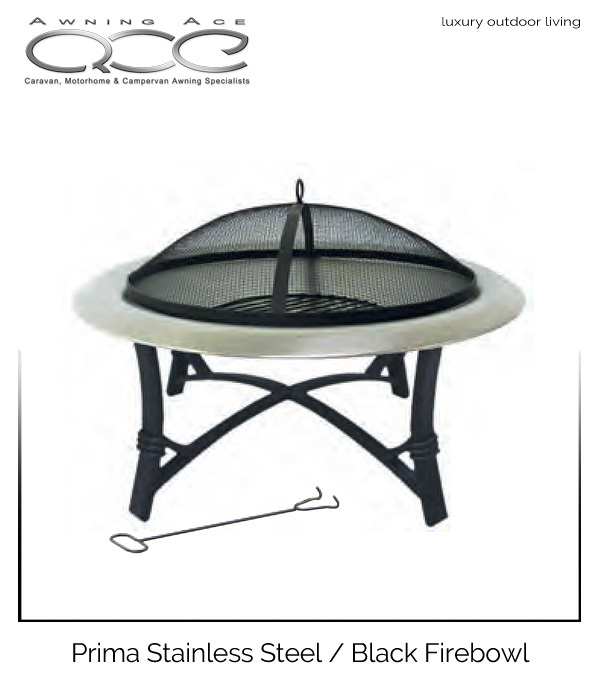 Contemporary stainless steel designed fire bowl with durable black steel framework. Comes complete with black grate and protective fire mesh. For your extra peace of mind, all purchases are covered by our 14-day exchange or money back guarantee (excluding any carriage charges incurred). If you change your mind for whatever reason, return the unused item(s) in their original packaging to Awning Ace Limited accompanied with the receipt/invoice and we will be pleased to offer you an exchange or refund - no hassles, for your total peace of mind. All new products are guaranteed against manufacturing defects for 12 months from the date of purchase unless otherwise specified. If a fault does occur during this period, we shall arrange to have the item repaired or replaced after it has been inspected. Any delivery charges will be met after inspection of the item. Factory Second/Store Returns items have the same 14 days no quibble exchange or money back guarantee as detailed above. Consumer Contracts (Information, Cancellation and Additional Charges) Regulations 2013. These apply to sales of goods or services to consumers without face-to-face contact. This includes selling by mail order, through the internet, or by telephone, fax or text message. Your right to cancel under the Consumer Contracts (Information, Cancellation and Additional Charges) Regulations 2013: You have the right to return your purchase for a full refund within 14 days. You are responsible for paying return postage costs for unwanted items. Items must be returned unused, in a re-saleable condition in their original packaging. Upon receipt of the returned goods, we will aim to process your refund as quickly as possible (the original delivery charge will not be refunded). All purchases should be checked fully within 28 days of the purchase date. Tents and awnings should be checked before embarking on your first trip. In the unlikely event that you will need to return your purchase due to a manufacturing fault, or it is damaged or the wrong item, we can organise collection and exchange for you. If you wish to return the faulty item by post or your own courier we will reimburse the cost up to a pre-agreed amount. Your goods MUST be packaged adequately for transport in a cardboard box or other suitable packaging. The responsibility for the safe return of purchased good remains with you until received by a member of our staff. Please use an insured courier service for your own protection. All goods returned must be clearly labelled and have full documentation enclosed including the reason for return. All returnable goods must be reported to Awning Ace Limited. Goods returned without any notice will not be accepted. Carriage charges are non-refundable unless goods are faulty or have a manufacturing defect. All other goods must be returned at the sender's expense. If required, the company offers a collection service at a charge of £19.00 per parcel (up to a maximum of 30kg) from addresses on Mainland UK or the Isle of Wight. For collection from other locations/countries please call for a quote. a) Your tent/awning must be clean and dry. It is your responsibility to ensure the item is packaged in a cardboard box or other suitable packaging suitable for safe transport. Failure to do this will result in the couriers refusing to collect the item, or us sending the item back to you unprocessed. Redelivery to you will, under this circumstance, be at your cost and must be paid for in full before despatch. b) In some instances it may be necessary to send your returned item to the manufacturer for inspection - please allow up to 28 days for them to process these returns. Naturally, we will keep you informed of any delays together with updates on our investigations. c) Please include a full description of the fault together with photos of the fault (where possible) with your item, along with a copy of your original receipt/invoice to enable us to identify and process your return as quick as possible. 4)If your tent/awning is deemed by us or the manufacturer not to be faulty, we reserve the right to dispatch your item back to you at your cost. 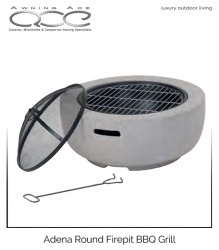 The amazing Adena Fire Pit is constructed from the revolutionary MGO material making a modern and extremely durable garden fire pit.